2. Old School is defined as music created before 1999 (with the exception of this week). 6. Have fun & don't forget to leave comments for other participants. If you want to join in on the fun, click here. First let's listen to Ms. Badu "The Other Side Of The Game"
Good picks Badu is the poster child for Neo Soul. Yay Maxwell! 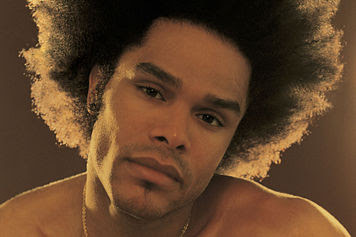 Eagerly awaiting his return to the music scene...even if its fro-less. MAXWELL! All right PJ, you're trying to make me swoon (LOL). Love me some MAXWELL. I'm laughing at myself because any minute now, old school will include songs made popular when I was in my forties. I am visiting from Barbara/Layla's blog because I loved your comment on moderating and wanted to see what you were about. I loved the Maxwell video and love Neo Soul. Wow, is he pretty!!! I'm really getting to like neo-soul! Of course Neo-Soul sounds good at any time of the day, but listening to the Erykah Badu clip was just right for a Sunday morning (which is right now). I wonder if Erykah got a kink in her neck from that ginormous Afro wig she was wearing.